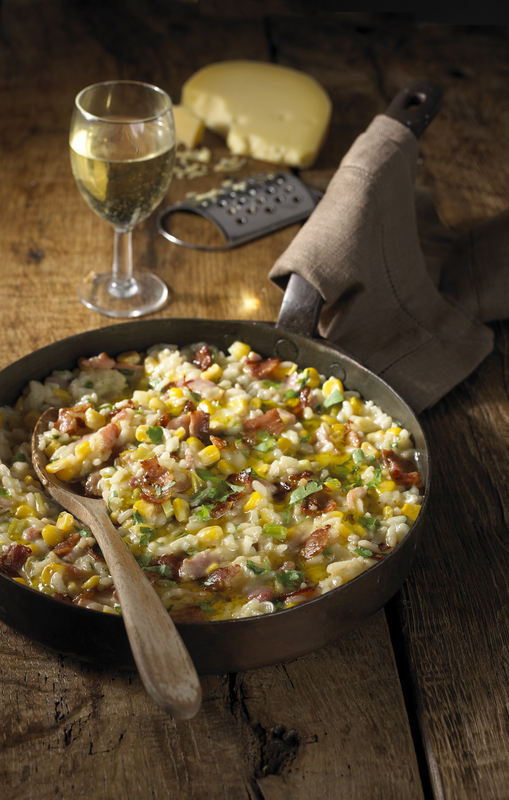 Smoky Corn Risotto | Flavor Your Life. In a large saucepan, heat 1 Tbsp of the olive oil. Add the chopped bacon and cook until it begins to crisp. Turn down the heat. Add the scallions, garlic, and drained corn. Cook 3 minutes until soft, stirring all the time. Add rice and cook for 3 minutes, stirring all the time. In another saucepan heat the wine and broth. When warm, begin to add the wine/broth liquid, a ladle at a time, to the rice mix. Stir constantly until all of the wine is absorbed. Cut the butter into cubes and add one cube at a time to the rice, stirring constantly until all the wine and butter are absorbed and rice has a creamy consistency, about 20-25 minutes. Remove from heat and stir in the parsley flakes, smoked Gouda, and 1 Tbsp of the olive oil. Mix thoroughly. Best served warm. Divide onto 4 plates.